The Floating Islands of Some Sevit has been undergoing an interesting transition in its identity since its opening but it seems to be finding its grounds now. In addition to holding a number of meeting spaces and operating as a convention venue, it houses a number of shops and restaurants within. In terms of eateries there's a buffet, a lobster place, and there's also the Vista Pub. Describing itself as a brunch and casual eatery spot, I've had the opportunity to visit a few times for work. Located within Gavit Seom, one of three of the floating islands, it's quite a spacious spot that has a casual, laid-back atmosphere to it. There are plenty of tables so it's not a bad place for larger groups. And, naturally, the window seats overlooking the Han River are most in-demand. In particular, you get some great views of the Banpo Rainbow Bridge Fountain show during April-October when they're one. On the menu are several ala carte options ranging in everything from pizzas (margherita, gorgonzola focaccia and, interestingly, chocolate with each pie ranging from 21-23K), salads (salmon, caesar, pasta from 16-18K a plate), pastas, steaks, and more. Full menu can be viewed here. They also offer set dinner menus, desserts, and bar food. If you're not hungry, they carry an extensive list of drinks, juices, beer (bottled and draft), cocktails, and wine. Though there isn't normally a lunch set menu, on one visit I was there for an event so this was the menu for us. Kicking everything off was the salmon gravlax with tomato jelly. Presentation was pretty enough but like its deconstructed state, there was just something about it that didn't quite come together fully. A bit of pesto? Some more sauce? I couldn't quite put a finger on it. I can't remember what drink this was but it was non-alcoholic but pleasant enough. Nice pumpkin soup. Definitely not a case where they overloaded it with sugar. Tenderloin was great overall. Cooked as ordered (medium rare) and juicy enough. Without the red wine sauce though it was slightly underwhelming in flavor. The mashed potatoes could do with some butter to make it taste less watered down. On a separate visit I tasted the pizza which was fine but too expensive for a margherita. The pizza was, as you can see, also a bit unevenly cooked. My favorite dish I've had here though has been the hot spicy pesce stew. I think it's more a soup than a stew but it's still loaded with clams, shrimp, mussels, and vegetables in a spicy, hearty broth that's reminiscent of an upgraded jjambbong. Nice dish! Vista Pub is a mixed bag of sorts in the food department. The food, by no means, isn’t terrible but there is little that stands out about it. If you remember that here you’ll be paying a premium on the food for the location and view, it’s not too bad especially when considering it’s one of the very few Seoul restaurants that’s situated right on the river. But certainly Vista Pub is not somewhere I’d recommend someone to go out of the way for for the food alone. Despite the Han River being such a central component of Seoul, there are surprisingly few restaurants situated right on the river. 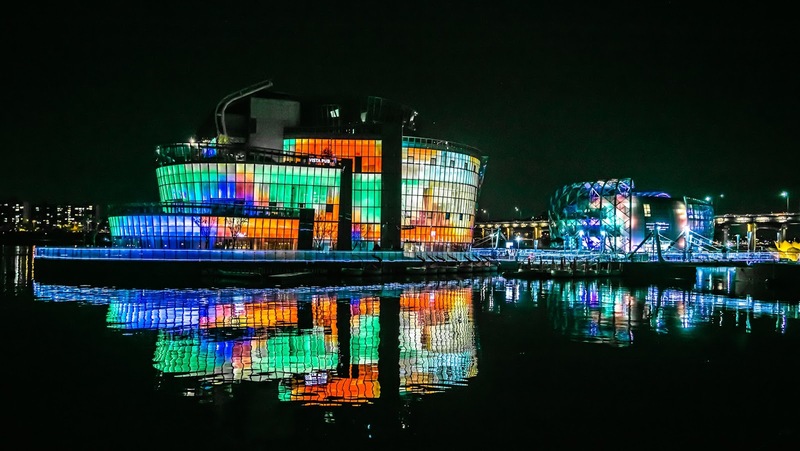 Vista Pub is one of the few that falls in that category with the advantage of it being situated right next to the Banpo Bridge and the Banpo Rainbow Bridge Fountain show that’s put on daily from April to October. While the menu is diverse and food ok, it’s the view and ambience people come for at Vista Pub (and what is behind the premium in food and beverage prices). If anything, I’d recommend Vista Pub for an after-date location or casual but a little more upscale spot to enjoy some light drinks and snacks. Navigating to Some Sevit or the Banpo Bridge from the Express Bus Terminal is doable but not the easiest of journeys. 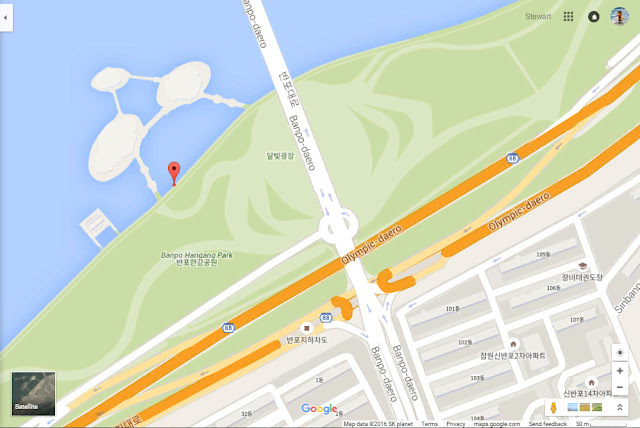 From exit 8-1, walk straight for about 240m and then turn right at Banpodae-ro. Head up north for roughly 800m or so and you’ll soon start seeing signs that point you towards the Banpo Hangang River Park. If I recall correctly you’ll end up at a pedestrian underpass or tunnel of sorts before emerging out to the Hangang River Park. From there find your bearing towards the Some Sevit or the Banpo River Bridge which the floating islands are situated right next to. Note though that the total distance from the exit to the floating islands is about 1.3km. Otherwise, take a cab from exit 8-1 for a fare that shouldn’t come out much more than the basic fare. Do avoid traffic time though as this area can get quite congested. The Banpo Hangang public parking starts off at 1,000 won for 30 minutes and then 200 won every 10 minutes. A full day parking is 10,000 won. Beer (draft and bottled), cocktails, wine, and more all offered. The Vista Pub is opened till 1AM so it's perfectly fine to come here for drinks or late night snacking. There's a Sebitseom membership that offers discounts and deals within the islands if you sign up. Members also get a 5% discount at Vista pub excluding special menus and beverages.